Welcome! and thank you for your warm affection! I thank Archbishop Marek for his kind words, and I greet fraternally Cardinal Stanislao and the Bishops present. You have come as representatives of the holy Church of God that is in Krakow, which welcomed me with open arms in the summer of 2016. You have come together with your Pastors and consecrated persons, to thank God for the life and pontificate of Saint John Paul II, near the 40th anniversary of his election to the See of Peter. I cordially greet all of you, especially the poor, the sick and the numerous young people taking part in the pilgrimage. St. John Paul II has enriched the universal Church with a great abundance of gifts, which in large part has inherited from the treasure of faith and holiness of your land and of your Church. He brought in his heart and, so to speak, in the flesh the testimonies of the saints of Krakow: from San Stanislao and Santa Edvige Regina, to Sant'Alberto and Santa Faustina. From them he learned the boundless dedication to God and the great sensitivity for every man; dedication and sensitivity manifested in his priestly, episcopal and papal ministry. He received from God the great gift of being able to read the signs of the times in the light of the Gospel, and he made it profit for the journey of his people, of your people, who in the various painful events never lost faith in God and fidelity to one's own culture rooted in the Christian spirit. Faithful to these roots, he tried to make the Church stand as a guardian of the inalienable rights of man, of the family and of peoples, to be a sign of peace, justice and integral development for the entire human family. At the same time, He has always emphasized the priority of grace and obedience to the will of God, before any human calculation. This rich heritage, which Saint John Paul II has left us, is for us - and especially for our compatriots - a challenge to be faithful to Christ and to respond with joyful dedication to the call to holiness, which the Lord addresses to each and each of us, in our specific personal, family and social situation. Dear brothers and sisters, Saint John Paul II does not stop watching over the Church in Krakow, which he loved so much! From heaven it accompanies your journey: families, young people and grandparents, priests, religious and all consecrated persons; the most disadvantaged, the suffering. I too trust you with his intercession. 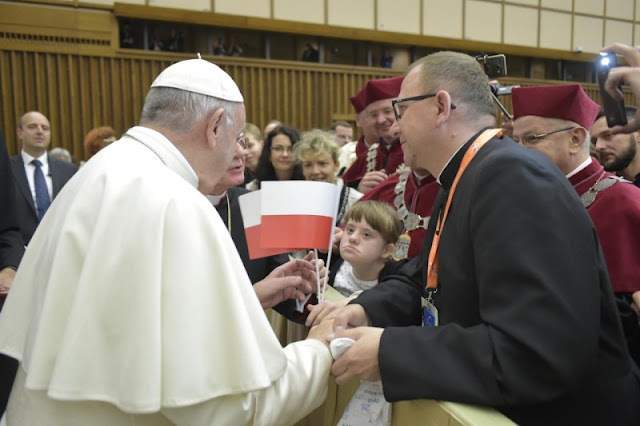 I thank you for your visit and I bless all of you and the entire diocesan community of Krakow. Please do not forget to pray for me. And, before giving you the blessing, I invite you all to pray a Hail Mary to Our Lady.